It is a rare treat to visit Newbury’s charmingly situated Watermill Theatre and Luke Sheppard's Oliver! more than makes the journey worthwhile. On arrival and in one of the most innovative mise-en-scenes, as the audience mingle on the lawn outside sipping Pimms and G&Ts, the cast’s ragamuffin kids dart about, not picking pockets but offering to shine shoes for a sixpence. It’s a charming touch. As is the way at The Watermill, the production is actor-muso, with the adult cast playing their instruments during moments that don’t involve them in the show’s action. Bart’s striking overture proves an initial treat and it sets the standard for the evening’s music. 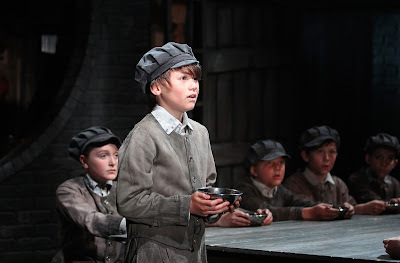 The production’s kids are an appropriately cute and talented bunch and on the night of this review the team of youngsters was headed by Thomas Kerry in the title role, with Archie Fisher as the Artful Dodger. Any production of Oliver! however will always be defined by its Fagin and Nancy and with Cameron Blakely and Alice Fearn, this show is in capable hands. If Blakely, the only actor who does not play an instrument, is initially a little too driven by stereotype he settles into the role well. Fagin should never be a truly sympathetic character, yet by the time he gets around to his wonderful Reviewing The Situation, the audience are laughing with him, not at him. Fearn’s Nancy is simply as good as it gets. Aside from her piano and recorder playing duties she looks and sounds every inch the protagonist of one of the most complex love stories in the canon, with a voice that is just sensational. 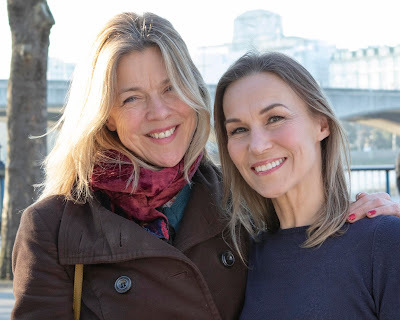 Fearn simply smashes It’s A Fine Life, whilst her As Long As He Needs Me both thrills and inspires, vocally soaring through her inexplicable devotion to Bill Sikes. It is a stroke of genius that sees Sheppard set Nancy’s act two opener Oom-Pah-Pah, traditionally staged in an East End pub, back on the theatre’s lawn as the audience are finishing off their interval libations. Fearn’s delivery is bawdy, raucous and with a singalong encouraged if it wasn’t for the downright prosperity of surrounding Berkshire, close your eyes and you could almost be back in Whitechapel! Choreographer Tim Jackson also makes fine use of his cast within the compact space. The ensemble numbers are thrilling and Jackson’s work is Who Will Buy? is just a delight as the stage gradually fills to a rousing street scene. Kit Orton (strings and percussion) puts in a fine turn as Bill Sikes, bringing a detached menace that convinces us of the evil lying at his villain’s core, whilst Steve Watts’ Mr Brownlow is the most compassionate of patricians who also proves a rather dab hand on the trumpet. Susannah van den Berg, always a treat to see perform, cuts a matronly figure as the hard-hearted Widow Corney and also impresses with a wonderful voice and a talent for remarkable range of instruments. Perhaps the most impressive musical moment of the night comes from Deborah Hewitt, who when she’s not playing Charlotte, is either tucked away on her drum kit or even more impressively, roaming the stage in a masterclass of syncopation, strapped to her one-(wo)man-band contraption. A nod too to the comic crafts of Tomm Coles’ (wind) Mr Sowerberry and Graham Lappin’s (piano and trombone) definition of vacuous pomposity, Mr Bumble. Given the impoverished backdrop to Oliver!, the economy of doing away with a separate orchestra works well and amidst Tom Rogers' striking multi-level set design and Howard Hudson’s trademark stunning lighting, the time and place of a grim Victorian London is thrillingly captured. If Lionel Bart is looking down upon the Watermill’s production, he’s surely smiling.